ASPRunner creates set of ASP pages to access and modify Oracle, SQL Server, MS Access, DB2, MySQL, FileMaker database or any other ODBC datasource. 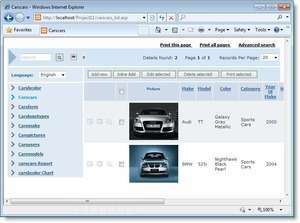 Using generated ASP pages users can search, edit, delete and add data into database. Designed to suit all users from beginners to experienced developers, ASPRunnerPro creates Active Server Pages (ASP) enabling users to search, edit, delete and add data to the Oracle, SQL Server, MS Access, DB2, or MySQL databases. For security reasons, you should also check out the ASPRunner download at LO4D.com which includes virus and malware tests. Additional screenshots of this application download may be available, too. 3 out of 5 based on 3 ratings.